Our flooring and moulding products are warranted to be the grade, species, and dimension represented in our sales order acknowledgement. Prefinished flooring is expected to be the color and finish coat represented in our sales order acknowledgement. In prefinished flooring the finish is warranted not to peel or to wear through to the wood surface within fifteen years of normal residential use. It is not warranted against scratches, pet damage, or slight changes in gloss due to normal traffic. 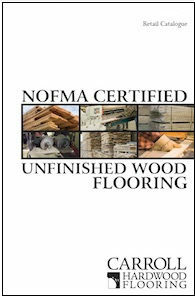 All flooring is warranted to be within NOFMA specifications at time of shipment. All products must be examined within 7 days of receipt and any variance from the sales order acknowledgement must be reported within that time. Installation of any product denotes acceptance with regard to species, grade, moisture content, dimension, and finish color. The physical performance of flooring and moulding products is warranted for one year after shipment, with the express exclusion of any shrinkage, swelling, cupping, and crowning due to jobsite conditions at time of installation or change in jobsite conditions thereafter. All products must be stored and installed in exact conformity to NWFA jobsite and installation guidelines. In the event of breach of warranty Carroll Hardwood will replace the defective product and pay a normal and customary labor charge to make the replacement. The customer agrees with purchase that any litigation with regard to these products will be tried in the courts of Carroll County, Tennessee. Now let us boil down the above to common-sense English. First, please understand that your happiness with the performance of our product is really important to us. We are in this business because we love it and we love our products and we believe their beauty can make people’s lives better. So, first, please look at your flooring and moulding as soon as you receive it to be sure it is in good condition when delivered and to be certain that it is what you actually ordered. Please take care to store and install these products carefully and in accordance with NWFA guidelines. Please take care of your flooring after it’s installed. If there is a problem with your flooring or installation, do not hesitate to contact us. Unfinished stock flooring returned to our plant within 30 days of shipment with the original strapping will be accepted for 100% credit of FOB mill value of flooring less a restock fee of $50. Acceptance is contingent on the product having been stored in a climate-controlled environment as attested by measurement of flooring dimension on return. All freight charges are the responsibility of the customer. Non-stocking unfinished flooring is not eligible for return. Prefinished flooring is run custom to order and is not eligible for return. As a contingency and convenience for our customers we accept returned prefinished flooring in the original boxes and hold it for resale as possible for their account.